Jacket with double button closure and hidden press studs at the front. Chest pockets with flaps and Velcro closures. Right pocket has mobile phone pocket. 2 inside zipper pockets. 2 front pockets with flaps and Velcro. Sleeves with Velcro closure. Pack pleat for better comfort. Flame retardant LOXY® reflectors. Well thought-out design details on pockets and pleat prevent embers from adhering to the fabric. 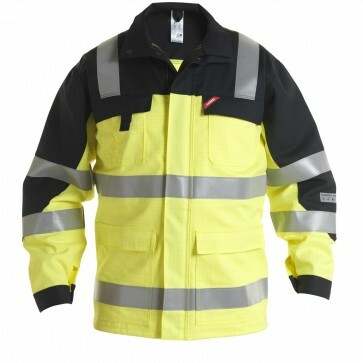 Antistatic and flame retardant and protects against liquid aerosols, spray and splashes from chemicals. Class 2 clothing.